BIBB / Upper secondary certificate, and then what? Which factors convince upper secondary school leavers to enter vocational education and training? In light of the rising numbers of higher education students, the Federal Institute for Vocational Education and Training (BIBB) has conducted a study into which pupils are more likely to commence a programme of vocational education and training despite having a higher education entrance qualification. The investigation also looks at the factors which may prompt such a decision. The results show that in addition to influences from within the social environment, the vocational orientation process and evaluations of costs, benefits and opportunities undertaken by the young people are also of relevance. BIBB is using the results of the investigation to develop recommendations for vocational orientation. Young people’s plans are strongly influenced by parental expectation. Only a small number of young people aspiring to enter higher education study think that their parents would prefer them to commence training instead. However, a young person is more likely to consider the option of training if he or she believes that this will enable entry to an occupation which is equally or more prestigious than the occupations exercised by their parents. BIBB experts thus advocate for social influencing factors to be included in vocational orientation measures alongside individual interests and goals. Creating an awareness of such processes among young people allows them to take them into account when making a decision. Both young people who aspire to higher education study and those interested in training expect higher education to be of great use. However, only those looking to enter training believe that VET will also provide such an advantage. It can therefore be concluded that the likelihood of considering training increases when people expect this route to offer attractive occupational opportunities. BIBB is thus of the opinion that more comprehensive information regarding career prospects after conclusion of training make training more attractive. The BIBB investigation further shows that young people are more likely to consider training if they have more specific occupational ideas. However, the results also indicate that some young people strongly believe that their occupational interests will be better realised via the route of higher education study. This applies, for example, to those interested in more abstract intellectual research or art and language. The fact that there are many training occupations of precisely this nature indicates to the BIBB experts that vocational orientation should address such occupations more actively. Examples include laboratory or IT occupations, technical product designer, plant technologist, book seller, media designer, make-up artist, and goldsmith. BIBB President Friedrich Hubert Esser thus calls for the following: “An overall societal debate on the value of occupations is required in order to get to grips with the losses in attractiveness being suffered by vocational education and training.” Professor Esser went on to state that the initial focus needed to be on according due recognition to the depth and scope of the attractiveness problem and on devising measures able to truly assist in stemming the trend towards academisation. These issues are being tackled by the recommendations which have emerged from the BIBB investigation and are also addressed in articles included in the latest issue of BIBB’s specialist periodical “Vocational Training in Research and Practice—BWP” dealing with the topic of “Routes into vocational education and training”. BIBB investigated data from the German Educational Panel Study (NEPS) in order to conduct this current analysis. The NEPS surveyed 2,500 young people, most of whom were aged 17 and 18 and were in their final year of upper secondary education. 16% of these respondents saw training as their future educational pathway whilst 84% believed that higher education was a realistic plan. The documents referred to may be downloaded free of charge. “Upper secondary certificate, and then what? 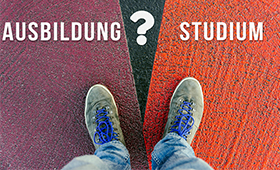 Factors which induce upper secondary school leavers to enter vocational education and training” is available at www.bibb.de/bwp-9613 (German only). The editorial by BIBB President Esser “What needs to be done first and foremost!” may be found at https://www.bibb.de/en/92325.php.